Los Gigantes is the most northerly of three popular resorts on Tenerife’s west coast, some 30km from the better known Los Cristianos resort. Along with Puerto de Santiago and Playa de la Arena to the south these are three laid back resorts far removed from the crazy nightlife of the mega resorts further south yet with plenty to keep everyone entertained during their holiday. In general this is the place for a relaxing break and is well suited to family holidays. There is little these days to distinguish any boundary between Los Gigantes and neighbouring Puerto de Santiago as they have practically become one resort. 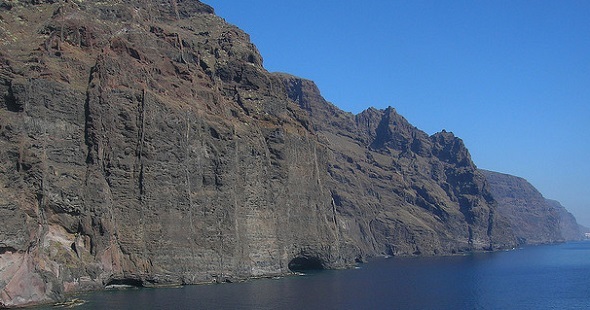 Geographically Los Gigantes is in a privileged position looking towards the magnificent ‘Cliffs of the Giants’ (Acantilados de los Gigantes) which ascend to heights of over 600m from the Atlantic. Boat trips from the marina in Los Gigantes are the best way to get a good look at one of Tenerife’s most stunning natural attractions. The town of Los Gigantes is centred on the marina where you’ll find a good range of bars and restaurants. Look out for the daily seafood specials. In the town, behind the church, is Sinatra’s restaurant which is well recommended as is the classier Rincón de Juan Carlos just off the main square. Down by the black Playa de los Gigantes beach, under the cliffs, is the ever popular Restaurante Marinero Jesse which is a fine spot for traditional Canarian dishes and local wines. As far as beaches are concerned the nearby Playa de la Arena in Puerto de Santiago is a far more attractive option. It’s well worth renting a car from Los Gigantes as there are some great excursions locally. The drive through the mountains to the stunnning Masca Valley with all its hairpin bends is spectacular and a visit to Mount Teide National Park is a must. If you’re not keen on the drive then there are coach excursions to these destinations as well as to numerous theme parks and water parks around the island. There’s also plenty to do locally including Tenerife’s best scuba diving, glass bottom boat trips and whale and dolphin watching excursions. You can also take boat trips from the marina across to the fascinating, unspoilt island of La Gomera. Public tennis courts, crazy golf and swimming pools are also available if your accommodation lacks any such facilities. If you’re around in July be sure to check out the spectacular fireworks displays during the local festivities.